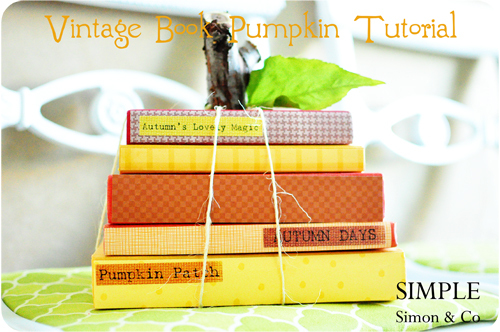 Miss Lovie: Vintage Book Pumpkin Tutorial with Simple Simon and Co.
Vintage Book Pumpkin Tutorial with Simple Simon and Co.
Hi. 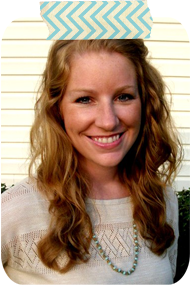 I am Elizabeth from Simple Simon & Co, where I blog with my sister-in-law (who has the same name) about sewing-especially vintage influenced, crafting, crazy thrifting finds, and $5 Fridays--where we see what can make for under $5! In our house right now we are redoing our office space, and I got some new bookshelves for my birthday (yes, I asked for bookshelves and a dress form for my birthday---so it's ok). And I am finding that bookshelves can be hard to style. 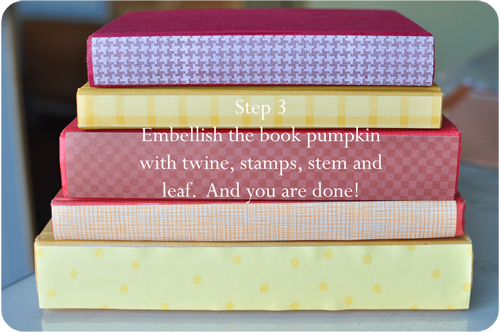 But out of my arranging and rearranging, and stacking and restacking the idea for this book pumpkin came about. By the way, I am still rearranging those bookshelves....anyone have any great tips? I bought all my books at the thrift store and made sure that they were all in the orangish color family, I really liked the varying shades. One thing to note, I love books. Really love books. I am a former teacher. 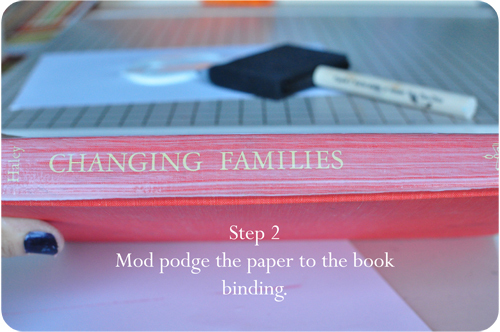 And I sometimes can't bear to see old books chopped up. (I know, I know, it's a bit crazy). 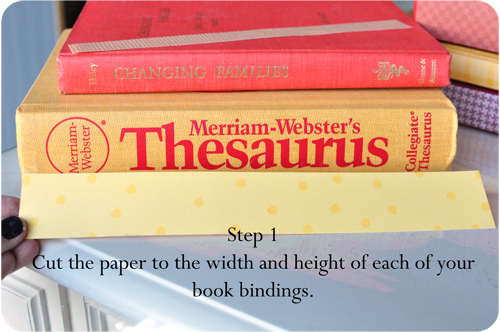 So, I didn't glue the books. I just tied them up with twine like you would tie ribbon on a package (really tight) and they have stayed perfectly. I also put the stem and leaf on using glue dots.....because I never know when I am going to need a book from the 80's on the Favorite Benefits of Canning....it may come in very useful someday! What a fun, unique project. I just love it. Aren't those fall colors so warm and inviting? I think when I stumbled upon Elizabeth and Elizabeth's blog, I was instantly blown away several of their skirts and outfits they had made for their daughters. And then I saw they had a $5 Friday section to their blog and I immediately clicked the follow button. Can you believe that these precious lace skirts , these hilarious mustached-cat pillowcases, and this bustle skirt are all part $5 Friday?! 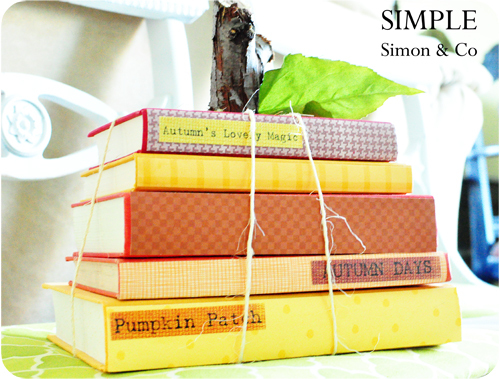 I'm telling you if you head over to Simple Simon and Co., you will be instantly hooked like I was. You also might want to check out her shop where she sells beautiful hand-painted dolls! And don't forget to check Elizabeth out over at Project Run and Play!! Her outfits have been to die for so far. Thanks, Elizabeth! 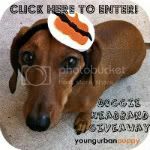 Be sure to click below to check out the giveaways going right now! Thanks for reading! And check back tomorrow for another great Creepy Crafty Halloween project! Thanks Allie! At least my house has one Halloween thing out now! Elizabeth...you do beautiful work! I love this very clever idea!